Don't just cook a meal for your date -- cook a meal with them. This activity is fantastic because it allows you to spend some quality time with your date and enjoy an experience together. You can find a nice, simple and fast recipe on AllRecipes.com and gather all the ingredients before they arrive. Not sure what kind of food your date enjoys? Time to do some profile stalking! Load up their OurTime.com profile and look for some cuisine that both of you would enjoy sharing. The great thing about this date is that even if the food only ends up mediocre, the company will still be enjoyable -- and you won't be the only one to blame! Almost every community has a local free art walk on the first, second or third Friday of every month. You can enjoy a casual stroll through the arts district of your town, enjoying the sights and entertainment. Local restaurants often have deals during their Art Walk -- such as extended happy hour specials -- and there's usually live music playing within one of the restaurants in the neighborhood. Don't feel as though you need to know everything- just enjoy the art! Want to do a simple movie night with a twist? If you've got a fondue pot, you're all set. This gives you an opportunity to really show that you're listening to your date - one of the most important pieces of dating advice after the first date. How? By getting all of your date’s favorite things: favorite types of chocolate and cheese, favorite types of fruit and bread and, of course, a favorite movie or television show. You'll be going out of your way to make an effort for your date, and all without having to spend an arm and a leg. Time to hit the profile again. Is there something that your date mentions always having an interest in? Sculpture, animals, discrete mathematics? Community outreach classes are usually held at local senior centers and cover a variety of fun topics. Not only will you have a fantastic date, but you'll also get a chance to learn something new! You can even invite some friends along -- though some people believe that having a group date violates second date rules, so make sure you ask your date their opinion first! If your date is active in the community, consider taking them to a unique volunteering opportunity in your neighborhood. Think about something that they likely haven't had the opportunity to do before, such as staffing a children's reading event. You'll be able to help others while spending time with your date and showing them that you have similar values. And obviously, it won't cost a dime! Cap off the experience by taking your date to a small coffee shop afterwards to discuss the experience and what you learned. You'll be able to tell quite quickly whether you two are in sync. Don't forget that there are usually coupons and senior discounts available for most activities. If you want to do something more traditional, such as dinner and a movie, you can often find a coupon on the Internet just by searching for it. If you’re looking for more ideas, check out this great list of dates under $20. And don't forget - when you find the right match, it really won't matter what you do or how much money you spend on the experience. Haven't found the perfect companion to do the things that you love with? 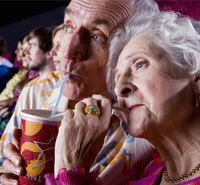 Try out a site like SeniorPeopleMeet, where seniors can meet other seniors who share their interests.